Melissa is a mom of 2 who loves to travel. She believes that you only live life once so why not make it count. Melissa would rather spend her money on experiences that can provide long lasting memories for her family. She loves farmhouse living and would live on a farm if she could. She’s an organic and natural living loving mama and has 3 kids. Ryan is 19, Taylor is 22 and Kori is 22. She is an animal lover and loves to sing and dance. She started her site as a ministry to help moms fight the rising costs of the economy by showing them ways to cut costs through couponing, shopping for sales and frugal tips. She believes that couponing is a privilege not a right and works closely with manufacturers and retail stores to bring couponing to a level that is beneficial to both. Melissa also enjoys working on Social Media campaigns for major brands. She believes in creating a personal relationship between the brand and their consumers. She is very much into taking the corporate out of the brand and bringing it down to the level where consumers can feel comfortable interacting and taking the brand seriously. Her site has now change over the years and while she still has some money saving topics she feels her audience has grown into a broader range of financial stability. While her readers may enjoy saving money on groceries they choose to splurge on travel , fashion and beauty. So Melissa has moved more in to a Lifestyle blog. Melissa has been married to her husband Daniel a.k.a. The Consumer King for almost 21 years and her family is very much involved in her blog. Melissa has been featured on the Today Show, Oprah Radio Network, Wall Street Journal, ABCNews.com, Ladies Home Journal and more! I am 43 years old and I just celebrated 22 years of marriage with my husband on October 7th. I have 2 children & 2 dogs,. We live in Edmond,Oklahoma. I have also been a member of Edmond Road Baptist Church for over 40 years where I participate in the music ministry. I was a stay at home for 12 years and started my site to help friends and family learn how to save money. It was a great hobby for me and it felt great being able to contribute to my family. In 1996 my daughter was born and the Dr’s told us she had a 50/50 chance of living. After spending a week in NICU we were able to bring her home. At that time our insurance did not cover pregnancy and on top of that we had the expensive bills from the NICU Unit. I was a nervous wreck on what we were going to do. In 2005 my husband was rushed to the emergency room on Easter morning and was later diagnosed with a degenerative disease called “ankylosing spondylitis”. Our life was totally about to change. Since there is no cure for this disease we have spent lots of hours in and out of the hospital, several surgeries and more meds than I can count on my fingers. My once small time hobby of pinching a few pennies here and cutting a few coupons there turned into a necessity. The Remicade infusions that was taking at the time were $8,000 every 6 weeks. This is just one of his many meds .Without insurance it would be a scary situation. My mom has Klippel-Feil Syndrome which she has had from birth. Basically she has fusion of the last 2 cervical and all of the thoracic vertebrae which causes Scoliosis. The last 3 ribs in front are also fused. She also has a splitting of the Spinal Cord in the cervical area about 1 to 2 cm. In 2009 my mom got very sick and had to go on disability. In Jan. of 2010 we made the decision to have my mom move in with us. (2011 My mom is now living in her own apt.) This has been a struggle both financially and emotionally for our entire family. In 2011 our home was taken by a flood and we lost pretty much everything and had to start over. But I have a strong Christian faith and God has helped us get through this tremendously. He has helped me see that there are many families out there struggling just like us and has blessed me with the ability to help teach others about my frugalness. That’s when my hobby became a ministry. In 2013 we had two big blows. 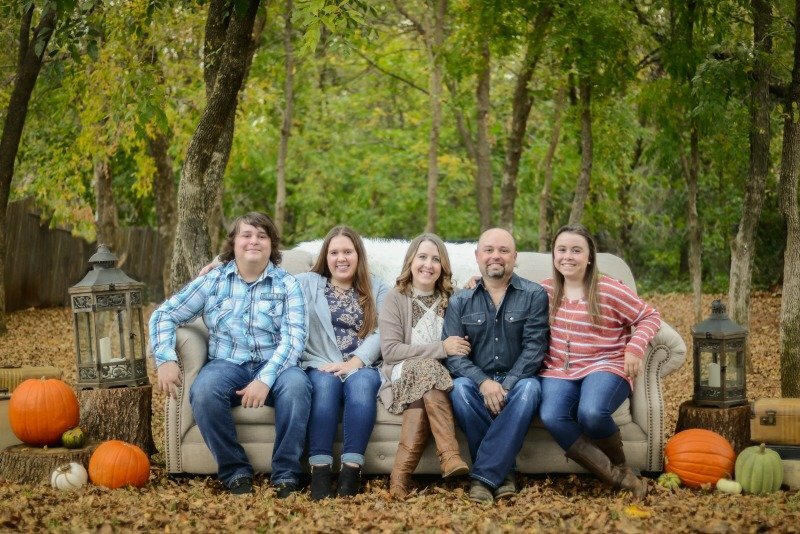 My 16 year old daughter was diagnosed with AS, the same disease as my husband. Watching your child go from a healthy bright upbeat child to someone who is constantly in pain is not something I wish on anyone. One month later I lost my job. I was absolutely devastated. I have 2 people in my home with huge medical expenses and I am the only bread winner in my home. Little did I know that God was actually answering a prayer. It was always my dream to blog for a living but I was completely terrified that I could not do it. Losing my job gave me the push I needed to launch what is now a successful career in blogging and brand consulting. I am now working with major brands more than ever and I have more time to meet with my fans face to face. In 2015 Melissa added one more to her family. She took in a teen who didn’t have a place to live nor any support from her family. She was basically homeless. Now she has a forever family. Kori is now 22 and in April of 2016 she and Melissa’s daughter moved into their own apartment and are doing very well. In 1996 Morestealsanddeals.com was formed which is now called ConsumerQueen.com. The original purpose of the website was to help other families struggling and in very similar situations like us feel good about being able to contribute so much just by clipping a few coupons. ConsumerQueen.com has grown extensively over the past several years with thousands of members across the United States. While members get great deals and awesome savings on things that their families use every day, many members “pay it forward” by donating some of the name brand items that they receive for free or at a very low cost to local churches and shelters. ConsumerQueen.com has been and always will be a free site for all who wish to register. Deals are broken down by store and explained so people new to couponing and those who have years of experience can all understand every deal. Every member is encouraged to post deals and to brag about their shopping adventures. We now teach our members how to save money in certain areas so they can spoil themselves in others. With our money saving tips you can feel good about indulging in life’s riches. I think my eyes were really opened up about couponing the day I walked out of a local Albertsons towing 3 grocery carts behind me that totaled $1880 and I only paid $19. I was able to provide enough groceries for my family and had plenty left over to donate to my church as well as the battered women’s shelter. Now this was one of my more extreme shopping trips but still to this day I am able to usually save 50 to 75% off my grocery bill if not more. I have been invited to do interviews with several local TV stations and newspapers. I currently do “The Deals of the Week” on the Jack and Ron morning show on Kiss 98.9FM every Wed. morning as well as All About You which is taped and aired Wed. nights. We have also been featured on the Today Show as well as newspaper and magazine articles.We are looking to expand our media exposure as we feel the more people we can reach the more people we can help. 2015 was interesting to say the least. We revamped our website and we are no longer just a money saving website but after seeing the wide range of fans we had visiting we knew we needed to expand. We now offer green living, natural and organic topics, recipes, DIY, entertainment and most of all my favorite part….. TRAVEL. My lifestyle has completely changed. I am now looking at more healthier options for my family and my husband and I have decided to travel as much as possible because we know that soon his travel will be limited. Our fans enjoy following along our adventures as we give tips on the best places to visit. In June of 2015 we added a new member of our family. We call her our God daughter. My daughter got a text from a friend that said can I spend the night with you and go to church camp with you guys tomorrow? Of course we said yes. However it was then at church camp we realized how the deep the situation was about to get when she broke down in tears in the cabin after only a few days. She told us that when she got home she would be homeless , that she would not have a place to go. After talking to my husband we knew God put her in our path for a reason. We brought her home with us and she has just blossomed into an amazing young lady who is going to school to be a nurse. God had provided my dream job and I am now blogging full time at home. Want to know more about our family? Check out Mom Thoughts. Our Media Page: (Interviews etc).